10" Tall. As anyone with a sibling knows, brothers and sisters sometimes don't get along! How much harder would it be if you were attached, and could breathe fire? 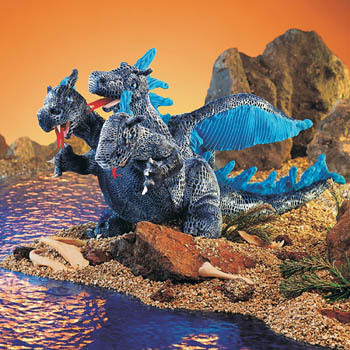 Find out with this Three-Headed Dragon puppet. Just slip your hand inside to animate the arms and heads, then let the bickering/braggadocio/blazing begin!